Time to see what the AMD Radeon RX 460 is capable of bringing to the crypto mining world. We got a Gigabyte Windoforce OC AMD Radeon RX 460 with 2 GB of video memory to test what hashrate it will manage to provide you with for mining Ethereum (ETH) and other popular crypto algorithms. The Radeon RX 460 is currently the leas powerful model of the new RX series from AMD, it comes with just 896 stream processors, uses x8 PCI-E lines, relies of a 128-bit memory bus and comes with 2GB or 4GB video memory clocked at 7 GHz. The biggest advantage that the Radeon RX 460 has is the low power usage that the card has, below 75W TDP as it does not feature a PCI-E power connector for external power. The big question however is how much performance it manages to provide for the low power usage it has. 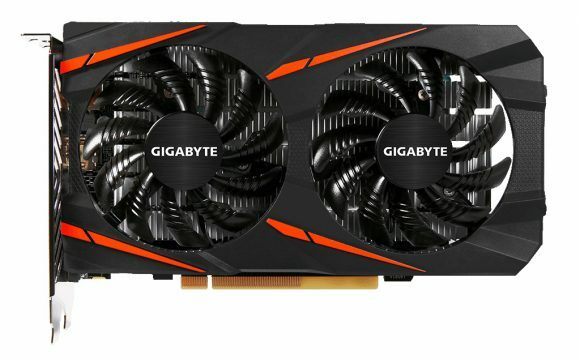 Do note that we are going to be using a 2GB video card here and for Ethereum mining that can cause some issues as some of you probably know already. Some video cards with 2GB video memory by default produce an error when you try to mine Ethereum with them, but the good news is that with some extra commands you can still use them. Here is How to Fix Ethminer Not-Working Issues on 2GB GPUs, this trick also does the job for the RX 460 2GB. 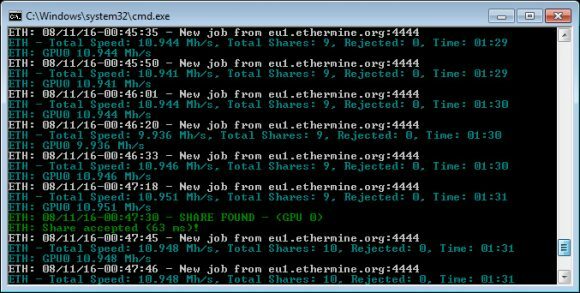 Let us see what the Gigabyte Windoforce OC AMD Radeon RX 460 2GB can do when mining Ethereum with the Claymore Dual Miner – about 10.9 MHS average. That hashrate is a direct result from the 128-bit memory and the 4GB versions should do the same as they are also equipped with 7 GHz video memory using the same width of the memory bus. The hashrate is pretty much half of what a Radeon RX 470 with 7 GHz video memory and 256-bit memory bus provides as you can see from our review of a 4GB 7GHz RX 470 here. The obvious thing to do here is to try and overclock the video memory to see if we can squeeze some more extra performance by going over the default 7 GHz (1750 MHz) frequency. Well, you can go quick a bit overclocking the video memory, however pas the 7 GHz mark it apparently switches to more relaxed timings and thus you don’t actually see increase of the hashrate, but a drop. So overclocking the video memory is pointless for Ethereum mining, though for gaming it should still result in some extra performance increase. With the stock settings for the GPU and memory when you are mining Ethereum (ETH) you should be below 60W of power used by the video card in total, though you can probably further reduce that with some tweaking while maintaining the same hashrate for mining Ethereum. The default setting for the fans manages to keep the card at 68 degrees Celsius with just the fans rotating at 33%, maxing them out to 100% makes the card a bit noisy, but the temperature goes down to just about 50 degrees. 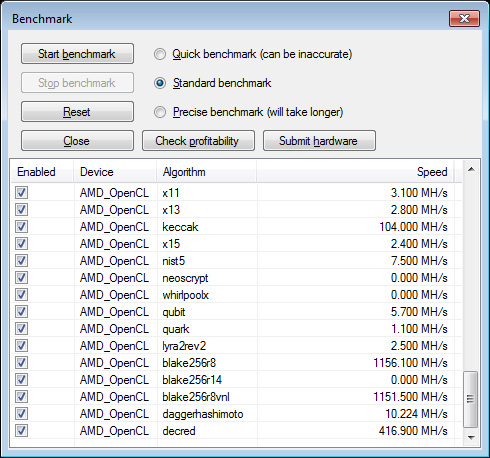 Here is how the situation looks for other popular crypto mining algorithms, tested with the latest NiceHash Miner. It is as expected, the RX 460 is more than two times slower than the RX 470… but with the 460 having less than half of the Stream Processor of a 470 it is normal that GPU intensive algorithms will be slower. Furthermore, without Ellesmere-specific optimizations for certain algorithms the hashrates produced with the default kernels for some algorithms do seem really disappointing when compared to optimized kernels on 280X and 290X or the 300 series. So while the new Radeon RX 400 series does manage to do quite well in Ethereum mining (memory-intensive algorithm) the new GPUs from AMD are just lacking the raw power to be able to offer really good hashrate for other GPU-intensive algorithms.